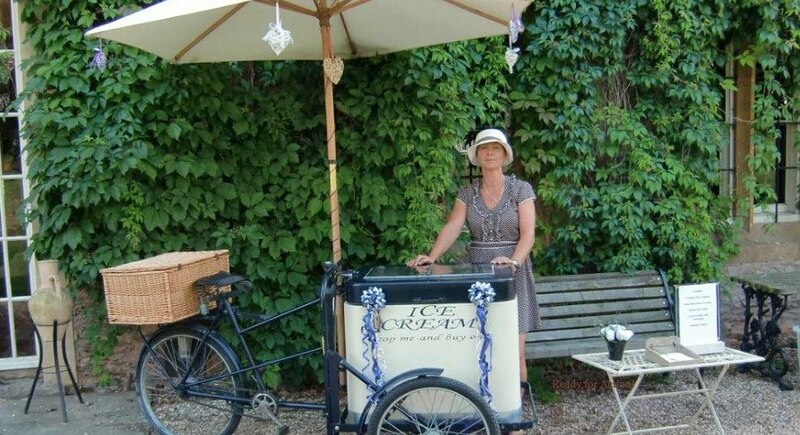 Ice cream trike for weddings, private parties and corporate events. 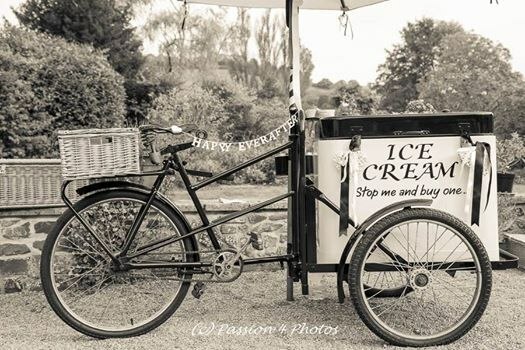 Original 1920's Pashley ice cream trike available for hire for either weddings, private parties or corporate events serving real Devon clotted cream ice cream. No electricity required so very versatile and we can be sited either indoors or outdoors. The bike comes decorated in traditional navy and cream ribbons with fairy lights (optional), hessian or floral bunting, or colours can be matched with the theme of the event. Professional, experienced staff wearing traditional 1920's dress are always guaranteed to give you friendly service for that special day. Registered Health and Hygiene certificates obtained. 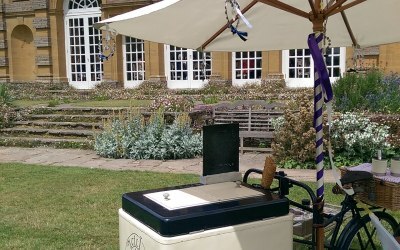 A help-yourself side table is offered along with the ice cream, up to a maximum of six flavours of your choice including sorbets if required, and contains a variety of sweets including marshmallows, chocolate flakes, buttons, Haribo, jelly babies, smarties, sprinkles etc. Please feel free to contact us to discuss your requirements. 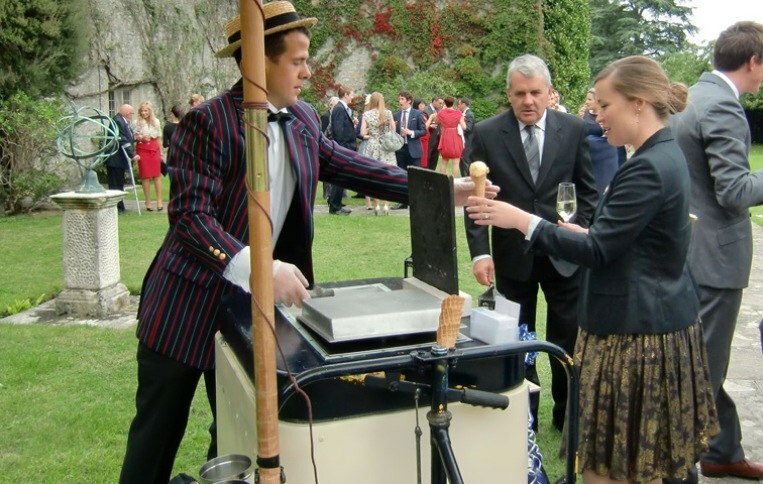 We provide real Devon clotted cream ice cream and sorbets for weddings, private functions and corporate events. We have dealt with companies such as the BBC, GoOutdoors, Volkswagen, Universities of Exeter and Plymouth, and also a large variety of charities such as D'Arts Fest for mentally handicapped young people, Cancer Research UK and the Blue Cross. Loved by everyone at the wedding. I was so pleased to have booked Icicle Tricycle. The ice creams were scrumptious and thoroughly enjoyed by everyone at the wedding. I would thoroughly recommend to anyone. Wonderful addition to our festival! 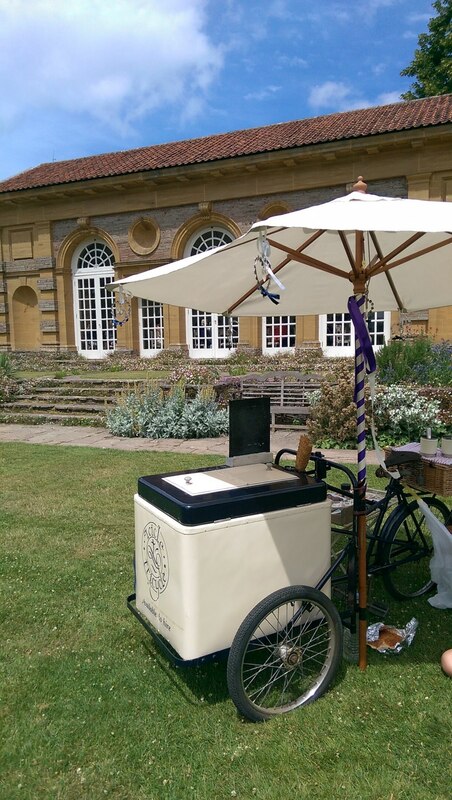 Icicle Tricycle provided delicious ice cream in waffle cones at D'Artsfest...a small arts and music festival for people with learning disabilities and their families and carers. 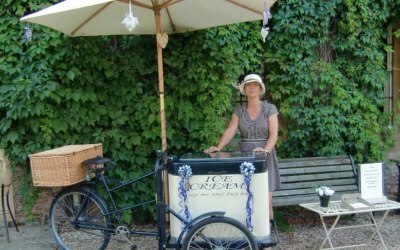 The ice cream cart looked wonderful in the field. From the start Vicky provided a very professional service with excellent and friendly communication and to top it all gave our charity 10% of her takings. We will definitely book her again. Get quotes from Icicle Tricycle and others within hours.